Do you know the difference between the voice of God and the voice of man? Can you recognize God's voice to you? Jesus taught that those who belong to God hear what He says. Did you know that it's possible to tune God's voice in so you can hear God better? Today we'll talk about the dangers of confusing mans voice for God's voice and four ways to remain focused on God's voice. #1 - Never ever _________________ the voice of man as the voice of God. There is a very good reason why this is 1st. God is the only person to be worshiped. We are the only creation to be given a voice that can worship. That voice should be directed to God - to give Him glory and praise. Read this carefully. Angel struck Herod down, but he didn't die immediately. What's in between? "... and he was eaten by worms..." To understand the severity of the offense and the penalty, remember that God did not cause the angel to strike Herod down after murdering the disciple James! But take on the glory of God for yourself?! How did Herod find himself in this spot? What's the core of the problem? Two weeks ago, when we talking about humility, we said humility was having a proper understanding that the world doesn't revolve around us. God is at the center of everything. So humility is not self-condemnation and negative self-esteem. On the other hand, it's not raising myself up above either. Whenever I / you find ourselves sitting on our throne, watch out! Especially a problem for those in the SERVICE of leadership. Good leadership IS SERVING those you lead by humbly and responsibly making wise choices and guiding in the correct direction. When done right it benefits people/followers AND brings glory to God! #2 - The voice of God is the voice that always ______________________ . Remember WHY it is that you are Protestants. Remember the reason for the Reformation in the 1500s. What are you protesting? Why did the church need reforming? Because it set up the voice of a man to equal position with the Word of God. Both together were officially considering the voice of God. No! The Word of God - THE voice of God prevails! It's why everything we hear must measure up to God's Word! #3 - So how do I stay focused on the voice of God? Whether I'm a leader or a follower, how do I always make sure to be able to hear the still, small voice of the Holy Spirit and follow where He leads? It's easy for us to disconnect the chapters in our Bibles from each other. Remember there weren't chapters and verses until the 16th century. Wasn't originally written that way. Luke chooses to tell the story of the start of the Barnabas and Saul ministry partnership immediately after this story of Herod. In other words - here's how a leader got it wrong and here's how another set of leaders who got it right! We learn there are 5 named leaders (prophets and teachers) at the church of Antioch. 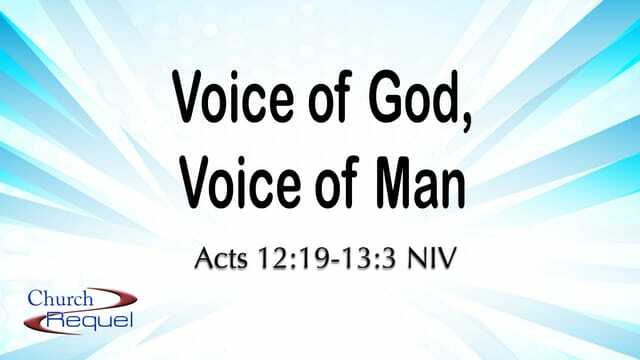 In the first 3 verses of chapter 13 we gain a sense of how they kept their sense of distinction between God's voice and man's voice. You can tell a godly leader - not by how good a speaker he is, or how authoritatively (or loud) he speaks, or by how large the crowd is that follows him - the measure of success for a godly leader is how much they follow God! How do they refer back to God? What is their humility in regards to God? They didn't have the benefit of the Bible then as we have it now, but I would add here: How much / often do they teach God's Word? Is there preaching marked by interesting stories and antidotes only? Is the Bible only sprinkled in to support what they want to say? Or do they / when they / speak with authority about God, do they do so with the full truth of God's Word in context with the whole of God's Word? THAT's the God voice! True worship is always God-focused. Can be both/either by oneself (devotions, quiet time) and/or corporate - with others. It's in worship that we reset our GPS about ourselves in relationship to others and to God. It's in worship that we are reminded who we are as created being and Who God is as the Creator, worthy to be praised. At first glance it might seem counter-intuitive why fasting would be so important as a spiritual discipline. But remember the objective - to be in a better position to be able to hear the still small voice of God. Anything we do - with purpose behind it - can be considered fasting if it puts us in that posture of listening to God's voice. Why fasting of food? When the tummy rumbles, we are reminded that our dependence is on God. We are reminded to pray. We are reminded to use the eating time as praying time. But it doesn't have to be about food. (That's why "purposeful self-denial.) Maybe there is a television watching time and we are more full of TV than we are of God? Then we fast (don't watch) TV for a period. Fill in the blank! Again, notice the connection between "fasted" and "prayed." They go together. Without praying, fasting is useless. Praying is both speaking and listening. They took the action of sending Saul and Barnabas only after F&P. And look at the results! What could God do with you if you were so focused on Him that you could hear Him clearly?